Notes from Social Media Club Auckland - The Retailers evening. 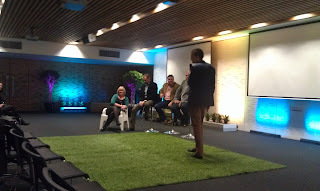 Tonight I'm in attendance at the Auckland Social Media Club. It's been interesting catching up with a few people who I've seen over the past couple of weeks. Tonights session is about Social Media in Retail with representatives from the following 3 companies, Harvey Norman, Dress-smart and Griffin's. - Promised to keep the volume lower than their TV Ads. - They had to move focus from being just brand marketing to customer loyalty. - They have been focused on developing a ROI tool to measure their effects on Social Marketing. - All people who have redeemed offers on Facebook didn't engage further online but redeemed vouchers in store. - They have faced challenges with funding and suggest that people fight for such funding. - Research has influenced the direction they will take with Social Media moving forward. Pre-demand has more impact than the price of their products. - Will be moving away from direct response campaigns to establishing 'eye-balls' through social. - Social is emotive by nature which provides and excellent place to create pre-demand. - Build a brand which is supported by an 'always on' strategy with Facebook. - A lot of companies are treating a Facebook page like a microsite, the reach they were seeing from Facebook was happening within the news feed. - Wanted to reach people and have them engage back with them. - They moved away from 'Market-place' ads to premium placement. - Major New Zealand companies should be thinking seriously about premium placements as they are seeing a 10x return as a result. - Facebook Offers is a tool they have used to gain access to people on mobile devices, which is a huge difference. The messages also come from a friend which helps to create a conversation. - In late May they had a successful offer around 50 months interest free for Apple Mac Computers. It went viral on Facebook by people seeing that their friends got a good offer. - A lot of New Zealand brands are overlooking social media as it is considered to be an after thought of a larger marketing campaign. Integrated campaigns preform a lot better - WOW. - To get the reach you want on Facebook is possible, but it does require a good deal of funds. - Make sure that organisationally you're working as a team. - There are four outlets throughout New Zealand hosting aver 100 stores. - They are working on getting engagement from their outlet shop tenants. - They are trying to get each outlet store to feed through information for Dress-Smart to send out on their behalf. - They are about informing people about what is available so that people think about what is available in their outlet malls. - They don't keep reiterating the same message on Facebook and Twitter, they keep answers to questions short and sweet. - Their two focused areas are about lifting the brand name and engaging their tenants. - Gaylene referred to a limited budget. - Griffin's have a communications strategy about bringing to life "Dear Griffin's". - Running a Social Media listening platform as a crisis mitigation tool. - Working on the 'Bring Back Choco-ade' campaign which they saw as a good example to get started with as a model for the future. - Build a simple harnessing tool which provided people a small incentive to get support around their "Bring-back" style campaign. - Quickly they got 8,000 likes in a 24 hour period which created an emotive connection based on memories, people and stories. - The next step was to create an army of advocates to quickly get people to share their experience about it tasting exactly the same as it use to. - People very quickly were able to show how they were enjoying the product which started a cascade of people talking about on Social Media. - They then took the product into the "Water-cooler" environment by doing office shouts. This was a way of getting people to share memories with their work colleagues, keeping the conversation going in the 'real world'. - The campaign became the biggest first week of sales by values in NZ scan data history. - 300k+ products sold in 7 days at full retail price in a market where nobody buys anything at full price. - The campaign reached over 1.4 million kiwis.